With the closing of the donation page, I am announcing the official end to this project's status as a fundraiser. At the same time, I'd like to encourage people to continue with their efforts in helping Japan. There may no longer be a page for donating on GlobalGiving, but Red Cross is still accepting donations. It probably doesn't need to be said, but the important thing is donating (time, effort, money), not donating through this project. So! I am extremely pleased to announce the final numbers on donations and the download count at the time of this posting. $306 (USD) to charities for general relief efforts, animal rescue efforts in Japan, and relief specifically for the disabled and elderly, and 1154 total downloads! And the download count just keeps going up. Fair warning - I'm about to launch into a gratuitous and exhaustive thank you/group hug. My personal gratitude goes out to every person who has donated to these charities - your financial contributions are helping now to improve and/or save lives (both animal and human). Be proud of yourselves. To every person who downloaded this compilation, who tweeted or retweeted about it, who shared it on a Facebook page, who told coworkers or family, this could not have been the success it is without your help. Every artist who contributed a song or graphic - whether or not it made it to the final compilation - should know that the selfless giving of your work made this a reality. Your willingness to give your creations to help make the world better is inspiring and laudable. You are the the heart of this project. Every individual who posted this compilation to his or her label, website/blog, or discussed or played some of its music on a radio program both traditional and internet-based, I cannot thank you enough for your work in spreading the word about this effort. In the same way that an artist gives his or her creative work, you have used your platforms built with immense amounts of time and effort to help create a better future for Japan. And, I have to say, I have developed a deep respect for every one of you - I had no idea how much work a project like this could be, and all of you have chosen to do this regularly! If any people think that you're of secondary importance to this project, they are greatly mistaken. And, of course, the volunteers. There's a list of each of them in the 'About' tab at the top of this blog. Please show them your gratitude by visiting their respective websites (each linked on that page) and giving them your time and attention. I could not have possibly done all of the work on this project by myself. They donated hours of their time - work that many of them normally get paid for - to taking care of crucial and difficult tasks. Every song that was submitted was evaluated by five separate individuals (Jim Butler, Ayoze García, Jason George, David Nemeth, and Allen Thompson), and there were lots of submissions. They spent their time over weeks going through those. And after that was done, the selected tracks had to be mastered. I've said this before: mastering is very hard work that requires a lot of time. As much as I am saying thank you, I almost feel like saying sorry to Steve Pahl and Tom Whittaker for putting them through this! To ask someone to master a compilation in as short a time as we asked is almost ridiculous, but for them to actually do it is just incredible and exceptionally generous. Really. Curating this compilation has deeply affected my perspective on how much of an impact art can have in the world. With this, I have seen that music can have be a tangible force for positive change in this world - and yes, this means free music, too. I have had people tell me that free music is free because it has no value, that it is only free because it couldn't be sold. I think that this has clearly shown how wrong that is. The Sun Will Rise is a testament to the generosity, compassion, and general altruism of our species. Every person that I thank for helping with this compilation, I thank for helping Japan and the people who live there. Oh, and congratulations! We've made this a huge success - it's not just that we made the compilation; we fulfilled its mission. This is deserving of celebration, so celebrate! This is it - the home stretch. At 10:00 PDT tonight, I will be ending the fundraising portion of this project and will no longer be posting to this blog. The Facebook page and Twitter accounts will be defunct. Due to numerous offline obligations, I'm unable to manage this project infinitely. Which is fine, really, because we've made this such a success. We being everyone who's contributed in any way, not the royal we. Download pages will remain online for as long as the services that host them exist. Just because the official fundraising portion is over doesn't mean that the compilation is dead. It is my hope that people will continue to discover this and follow links to donation sites to contribute to the ongoing efforts in Japan. Final Call: Spread the Word! With just one week left, the project's donation page has quieted down quite a bit. News outlets are reporting less about the disaster in Japan as other environmental disasters occur globally. While everyone cares deeply about the ongoing efforts to provide relief to those affected by the earthquake and tsunami in Japan, most people have already donated their time and money to various charities - and few people have enough of either to donate constantly. I say this because, based on the donations, it might seem like interest is waning. That couldn't be further from the truth; as of this post, we have hit 900 downloads of the compilation. People continue to discover this compilation, and though they may not be able to donate financially, they are helping to spread awareness of its cause. Sorry for the sudden font enlargement and bolding, but I have to emphasize this as best I can. We have done well in getting the word out, but we can do better! Contact your local radio stations; tell your friends, family, and coworkers; burn copies of the compilation to CD, write the URL to the Bandcamp/Archive.org page on them, and hand them out wherever is most appropriate. Everyone's work in promoting this compilation is what has already made this a success. If you are able to invest a little time and effort during this week to getting the word out, you can help take this project to its limits. I'm very interested in hearing about what you are planning on doing or have already done to help promote this, so post in the comments all of your creative and generous efforts! Only one week left - let's make it one to remember. My apologies for the lack of a post last week. Sick+work+home life... the usual. Post about the project coming up in a moment. Downloads are doing exceptionally! We have hit over 600 downloads total for the project - more than doubling our two week count in just one. I hope that we can keep the pace up over the rest of the month and break the 1000 download barrier soon. Keep spreading the word and the charity. Three weeks left! It is honestly hard to believe that only two weeks have passed since this album was released. In just that much time, we have raised $306 and have received over 300 downloads. At an average of $1 per download and $21.85 per day (that number just blew my mind!) since release, this has been an unequivocal success - particularly considering that donations are completely optional! For a free, netlabel-style release, this has received a huge amount of attention and an exceptional amount of money for charity. Through everyone's contributions, we have sent emergency relief supplies to Japanese citizens, provided special help to the elderly and disabled, and rescued animals and reunited them with their families. Every last one of you should feel proud - whether you contributed your music, your time and effort with promoting or working on this project, your money by donating, or even if you just so much as listened to it. All of it has been invaluable in promoting this project and its cause - and we've done a great job of it. There are a few things about this project that I would like to note. 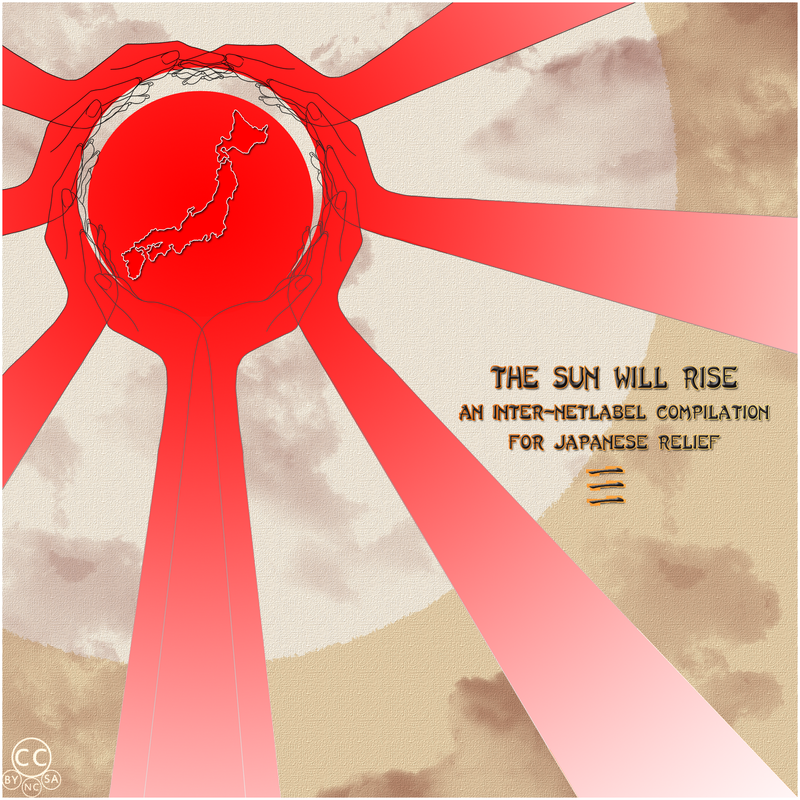 First, the participating netlabels and press page has been updated to include many more names of labels, blogs, radio shows, and the like that have put forth the effort to distribute and promote this compilation and its cause. I can't thank each of them enough for the help that their work provides to this effort. Second, my updates will now become weekly - the rate of changes to the project itself has slowed down immensely after the release, so while every day I am excited to see how many more downloads and donations we receive, I think that it would be wise to provide condensed updates at the end of each week. The third - and probably most important - thing is that the fundraising portion of the project will close on May 31st at 11:59PM PDT. The compilation will continue to be distributed for as long as the internet exists, and links will still be provided on ways to donate to the effort for those who wish to show their appreciation by donating to Japanese relief charities. The only thing that will be closing down will be the donation page at GlobalGiving. I am planning on throwing a party with all of my friends on the evening of the 31st where we listen to the whole compilation, and of course, where donating will be encouraged. I can't think of a better way to bring this project to a close than with a celebration of what we have accomplished while supporting the Japanese relief charities. I hope that everyone is having a good May Day. After running the numbers on what we've accomplished here, I certainly am. 72-ish hours after release, we have managed to raise $250 for various charities that are providing relief in Japan, and the compilation itself has received more than 150 downloads! This is exactly what I had hoped for. People from the netlabel community, one that normally involves no exchange of money whatsoever, are coming together to show their support for an important cause. Never let it be said that free music is without value. Netlabels, your help is needed! Or, at least, your help would be greatly appreciated. I have received numerous offers from netlabels to post about the compilation or to post the compilation itself since this project began. Unfortunately, I did not keep a list of every offer with contact information, so I am putting out the call to help again. As was sort of mentioned a couple of sentences ago, all that is asked is that a netlabel curator post the compilation as the label's own or make a major post about the compilation on the label website. The only requirement is that it must contain a link to the official donation page (http://www.globalgiving.org/dy/fundraiser/prevfund/gg.html?regid=5070) and have a method of downloading the compilation (be that through links to the Bandcamp or Internet Archive pages or by uploading it to one's own servers - or to other services entirely). Interested? Send me an e-mail at internetlabelrelief@gmail.com if you want to discuss it or if you just want to let me know that you've gone ahead and done so already. 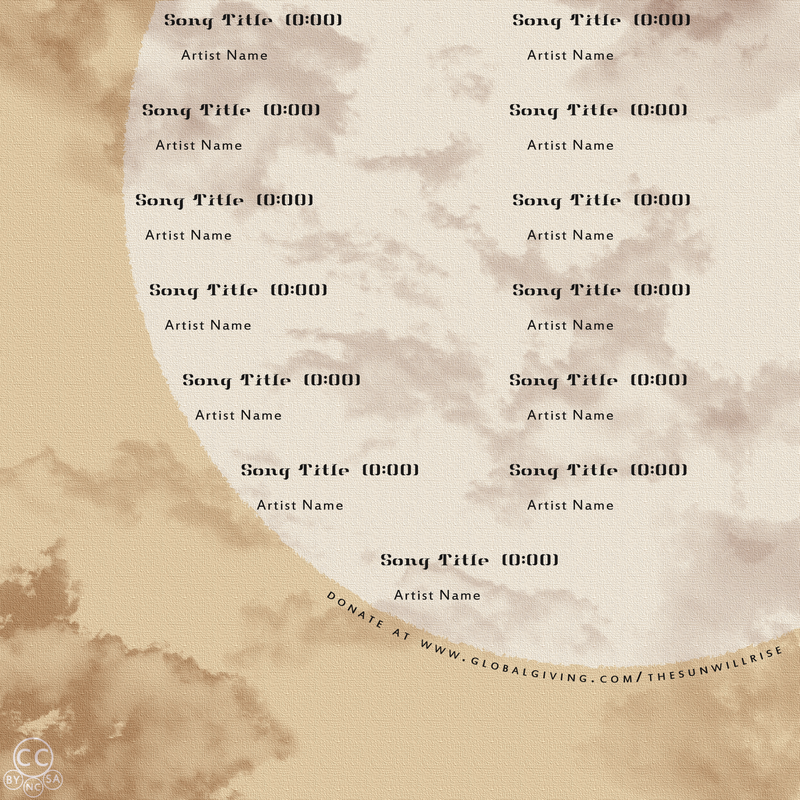 I will be creating a list of all participating netlabels tomorrow, and I will continue to update it multiple times a week. As always, I'd like to thank everyone for the continued support and assistance. I'm overjoyed to see our effort create tangible, positive results in this world - and to know that it's because of the charity of a truly global community. I have two things to say. First: Thank you to every single person who contributed in any way. Seriously. And Tom and Steve deserve heaps of praise for the incredible mastering they did in such a short amount of time - truly above and beyond. It's at the Internet Archive (though the vbr MP3 files seem to be taking their time with autoconverting, so I may have to upload them manually this next week) and Bandcamp. Donation page is here. Go listen and donate (if you can)! And if you encounter any issues, please, please let me know. Due to unforeseen difficulties (mostly technical in nature), the compilation will be released on April 17th. As much as I hate to push the release date back again, it needs to be done. Websites aren't working, file transfers have gone wrong unexpectedly, etc. Thankfully, everything is ready to go - it's just a matter of having the time to make sure that everything is perfectly stable once it is released. I really appreciate everyone's patience. This compilation may be taking a while, but it's worth it. Delay - Release: April 15th! My apologies for the sudden announcement. I had hoped that we could overcome some of the hurdles in time due to the exceptional skill of the individuals working on this project, but unfortunately, it really just comes down to having enough time to do all of the necessary work. While it is feasible that this compilation could be released tomorrow, it would require an extremely rushed mastering process that would be detrimental to the quality of the product. It was difficult to make this decision, but ultimately, I came to the conclusion that releasing a mediocre compilation (compared to what it could be) would be more damaging than waiting a week to officially release it. Additionally, this will allow me more time to prepare a good press release and to distribute it more widely; this will include giving me time to discuss releasing this with more labels. Here's a more succinct version. To give this project the time it needs to really succeed, The Sun Will Rise will be released on April 15th, not April 8th. I promise that your patience will be rewarded. Congratulations to Oliver Levy and JamFlavored, and thank you to everyone else who submitted cover art for this compilation. Believe me when I say that it was a difficult decision. Tracks will be sent off for mastering later tonight, and I'll be in contact with the artists about updating the rear covers with the correct information once I have the URL (tomorrow) and the front covers to have the appropriate CD number. Oh, and don't forget that this will be released on Friday! Let me be the first to say, HOLY %@#&, it's almost done! If the excessive use of exclamation marks in this post and in all of my tweets hasn't made it clear enough, I'm extremely excited. I can't wait to see how much money we are going to raise for Japan. Tracks have been selected for The Sun Will Rise! Congratulations to everyone whose track was selected, and a profound thank you to everyone who submitted a track. I had not expected such a close race, but after averaging the scores, I found that very few songs had scores below 8 (out of 10). The release shall be in the format of two CDs. Track order will be announced in a few days, and the tracks will be sent off to be mastered! Yet another deadline has passed. This time, we've received numerous submissions for cover art, all of them excellent. Selection on cover art will be made and announced tomorrow. Thank you to everyone who submitted and worked on cover art for this compilation. Really. Thank you to everyone who submitted music, and thank you to everyone who worked on a song but was unable to get it in on time. Songs are being evaluated right now. Listening is being done blind - that is, all songs have had their filenames changed to a specific number and all ID3 tag info stripped. All of the numbers are tracked to artist name and track name. Songs are given a numerical rating by each evaluator, and those ratings are then averaged. Selection will be based on those average scores, starting from the highest score and moving down until the compilation is full. The evaluators have been rating submissions as they've come in for the past week or so, and the ratings that I have seen so far indicate that there may be a lot of ties in the upper range - that is to say that the evaluators are really enjoying your music! We'll show the world that free music doesn't mean low quality music; that we can give our art away for free and create a positive impact in doing so. State of the Project, Day 17 - Deadlines! This post is going to be quite short - I think it's best that I just get to the point. There are only 48(-ish) hours left to submit your music piece! Click that link or the 'How to Help - Musicians' page for all of the guidelines and specifics. We need your artistic talent! We need cover art for two CDs and would like to have enough for three. Full detail are in that link or in the 'How to Help - Artists' page. So what are you waiting for? Upload your files, click send, and be a part of the effort! This is, after all, a project of collaboration. Without your support, we couldn't have even made it this far - and with your contributions, we can make this huge. I know from what we've received so far that there is immense talent in the netlabel community. Now's the time to show it! Thank you to everyone who submitted and voted on a name for this compilation. As you can probably tell from the title of this post, the votes have been counted and the most popular choice is The Sun Will Rise. Here's a look at the final tally, counting all tweets, facebook comments, blog comments, and e-mails. 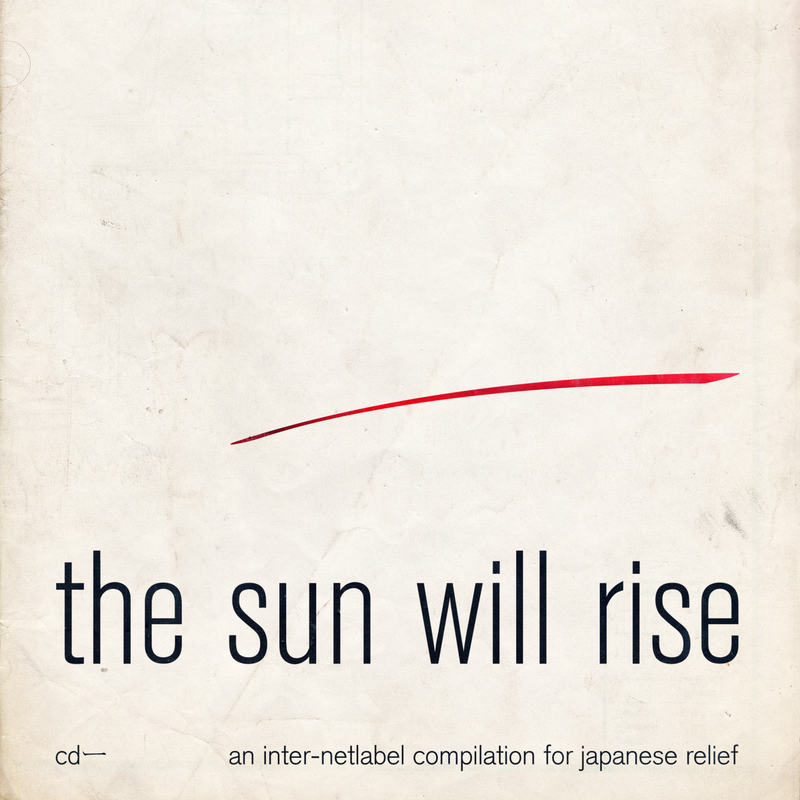 The "formal" title will be The Sun Will Rise: An Inter-Netlabel Compilation for Japanese Relief, and will be written as such on the album art, but emphasis will be placed on The Sun Will Rise. In fact, from now on, that's pretty much the only name that I will call this project. You'll notice that the blog title, Twitter page, and Facebook page have all been changed to reflect this new name. I should note that the nature of the project has not in any way changed; everything is being run the same as before, just under a new name. I'll be making another announcement on the Facebook page and on Twitter regarding the full details on cover art submissions shortly. As one competition ends, another begins! UPDATE: Submission guidelines are in! UPDATE: The voting time has been extended to end at 4:00PM PST. This is because, due to an oversight, I forgot to include the suggestion that got this whole competition going! If you want to change your vote to QuakeAid from a previous vote, please say so - just mention that you have already voted and that you now prefer QuakeAid. Voting time! Here's the list of names that have been submitted. Submit your vote via Facebook, Twitter, e-mail, or by commenting on this post. Voting ends tomorrow, March 29th, at 12:01PM PST. State of the Project, Day 14 - Name the Comp! I'll start with some great news. Twitter user @JesseSomfay suggested a non-profit alternative to JustGiving: GlobalGiving. I have created a tentative page as part of researching into it, but I will not be posting the link to that page until I know more about the website. At present, it looks like it is the best option, but it is too soon to commit to using it. Nonetheless, I am excited about what it has to offer. If you have any thoughts on this (GlobalGiving or options for donation methods in general), please let me know! Voting will begin tomorrow at 12:01 PM PST. I hope to see more suggestions in the meantime, and be sure to stop back by to have your say in what this compilation will named! Lastly, the evaluator and masterer positions are closed. I'll update the 'About' page to include the complete list of people in these positions. It's no exaggeration to say that we have some absolutely exceptional talent on board for this project - both in these positions and in the submissions that we've been receiving. Keep up the effort! I am a bit disappointed to say that, after doing a bit of research, JustGiving does not seem to be the best route for donations. It is an easy-to-use service, and pretty much all of the money does go to charities, but they are a private for-profit company. While this is not inherently wrong, it is at odds with the philosophy of the netlabel movement and, to an extent, Creative Commons. If anyone is aware of a similar service, please send me an e-mail or post a comment here/on Facebook/tweet @internetlabel. I'm also still looking for someone who can manage the donations aspect and take charge of this entire area of the project - while I am able to do it myself (and am doing so now), I am certain that the project would benefit from having someone dedicated entirely to that aspect. The naming competition is still on! The last day to suggest a title for the compilation itself is Monday the 28th, 12:00PM PST. Following that, voting will occur from 12:01PM PST on the same day to 12:00PM PST the following day (Tuesday the 29th). So get your suggestions in! I'll be posting all current submissions in tomorrow's State of the Project, and on Monday, I will post every one - and voting will commence! This will be followed by a two-day call for cover art submissions. Today is the last day to submit an application to be a reviewer or masterer for the compilation. Full details are in the 'Urgent Needs' section. I hope to see a torrent of e-mails and messages from everyone reading this. This relief effort can't happen without your involvement! Yesterday's call for a donations coordinator yielded a great comment on the blog from Warfreak2. He recommended a website/service called JustGiving, and after a cursory investigation, it appears to be almost precisely what this project could use. If you have any experience with JustGiving, please comment, tweet, e-mail, use smoke signals, etc. I am still interested in having an individual coordinating the donations aspect of this project, but it seems to be a bit less urgent than before. So, with much fanfare, I would like to announce a new competition of sorts. Please send in suggestions for naming this compilation! 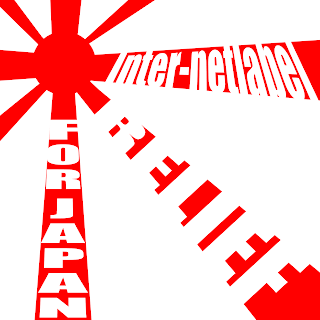 Right now, the name for the project - Inter-Netlabel Compilation for Japanese Relief, often shortened to Inter-Netlabel Relief for Japan - is fine for the project in general, but they're something of a mouthful. I received an e-mail that suggested that the project could use something succinct and easy to remember, something that could be easily shared. I'm not that great with naming things like this, so I've decided to take submissions and have a public vote in the same manner as the logo competition. I've also updated the 'About' page to include all of the current evaluators and will continue to flesh it out over the course of the project. Keep the submissions coming in - the deadline is still a ways off, but that's no reason to wait! The evaluators are busy with the music as is, but let's see if we can keep them busier! Today is marked by the addition of the to-be-spectacular 'About' page. Thus far, it only contains minimal information, but over the next few days, I'll be adding info about everyone involved with the project. So - I'm putting out a call to someone who would like to manage the donations portion of this project. Due to the important nature of this part of the project, I feel that it is exceptionally important that it be figured out sooner than later. Due to a variety of commitments and the unforeseen difficulty of negotiating this with PayPal, it would be preferable that someone who has more experience take over this aspect of the project. Please send me an e-mail if you're interested and, if possible, an example of similar work that you have done in the past. I'll be posting this blurb in the Urgent Needs section. I also have some plans for something similar to the logo competition that I will be announcing tomorrow. All official information about this project will be and has been posted exclusively to this blog, the Twitter account, and the Facebook page. In the spirit of even greater disclosure, I will be adding an "About" section to this page that will contain information about myself and, pending each person's approval, every other contributor (which, at present, are the submission evaluators and those who have offered to master for the project). I still need help with contacting PayPal. If you are able to be a liaison for the project in discussing details on getting donation buttons that donate to charities rather than a specific account, please send me an e-mail. I am even considering trying to find someone to be a general "donations coordinator" of sorts. I'll say more about it tomorrow. If you know of a way to help promote this project, by all means, do so or let me know about your ideas! We've had a lot of interest in this project, but I'm certain that we can generate more - and it will take your help. Never hesitate to contact me with your questions, comments, submissions, or anything at all, really. I respond to every e-mail personally on a daily basis. As always, thank you for reading and for every last bit of help. Alright! After a few days of computer issues, everything is finally back to normal on my end. I'm continuing to receive submissions at a steady pace, and while I don't have time to listen to every piece that comes in, I've thoroughly enjoyed what I've heard so far and have heard exceptionally positive things from the evaluators. I'm having a lot of trouble getting in touch with PayPal - they haven't responded to my e-mails, and for some reason, I can't get them to verify my phone number. I could really use someone's help in trying to contact PayPal about donations. As I described in previous posts, I would like to be able to post buttons that allow people to directly donate to charities through PayPal. If you are able to assist in this manner, I'll be glad to discuss all of the details through e-mail or another form of correspondence. I can't tell you how excited I am to say that I have received a most generous offer for this project. If anyone lives in the Chicago area and would like to record a song for this project in a studio, please send me an e-mail. There is an individual who owns a studio who has offered to allow artists to record in his studio for free (or at a major discount, depending on how much time is required). I'll be glad to put you contact with him. I currently have three or four reviewers on board (still corresponding with one) and two people available to master with two others as backup if necessary. I'm still looking for one more reviewer and one more masterer, though I'm not sure that there will be three CDs for people to master. As always, thank you for your help and your kindness. I'm so excited to see this project coming together so well. Today's State of the Project won't be very long. Submissions are continuing to come in at a steady rate, and I'm still trying to get things worked out with PayPal. If things don't speed up with that, I'm going to begin looking for some other solutions. As I mentioned in the last post, I would like to be able to allow people to donate directly to charities rather than forcing the money to pass through unnecessary channels. We have two people on board for evaluation thus far, and a couple of people who are willing to help if no one else steps up to do so. Check out the Urgent Needs! section to see what we need in this regard. Additionally, we still need people to take up the mantle of mastering. Two people have said that they can help if necessary, but that they would like to be backups. Tomorrow will not see a State of the Project update. At least, not unless there's some major news or a new need that pops up. Keep up with the great submissions, too. The quality of the works that we have received thus far is exceptional. This compilation is going to be incredible. And as always, thank you for your dedication, support, and effort. Every last thing helps - both for this project and for Japan. State of the Project, Day 4 - New Logo! I am excited to announce that the new logo has been selected. Thank you to every person who contributed a vote through Twitter, e-mail, and comments on this blog. I haven't taken a complete tally, but the vote was almost unanimous. Congratulations and a huge thank you to Kevin Nelson! Today's State of the Project is marked by some major improvements to the blog. First, it should be a lot more attractive now. Second, information on helping out with the project and guidelines on submissions should be much easier to locate with the list of pages at the top of the blog. Please check out the Urgent Needs! section to see the most important things that require your help. Also, updates have been made regarding art submissions - check them out by clicking the How to Help - Artists tab. Also, as I had mentioned would be the case in the last State of the Project, I have decided on what to do about deadlines. The new deadline for submissions is April 1st, 12:00 PM PST. This will allow us to release the compilation much earlier (April 8th) - and therefore generate donations to charities sooner. I am currently still working on getting buttons from PayPal that would direct all donations directly to charities, bypassing any sort of middle man. I'm hoping it works out, because I am sure it would help make the entire process easier and serve to be reassuring to donators. It would also greatly free up options as to where the album could be released, as the buttons could be placed pretty much anywhere. I deeply appreciate all of the kind words, beautiful submissions, and generous promotions of this effort. This is coming together better than I could have imagined. It shows what we can all do when we have a cause to unite us - and what an important cause this is. Alright! Here's where all of the submitted logos will be posted. I'll be posting submissions for part of today and all of the ones received by 12:00PM PST tomorrow (March 17th). Be sure to come back and vote on your favorite at that time by leaving a comment here. Day 2 is here, and it looks like the initial surge of interest is starting to slow down a little bit. While I'm slightly relieved that I may not have to spend the entire duration of this project listening to submissions non-stop, I'm hoping that we can figure out ways to sustain interest in this. If you know of any websites where you could imagine seeing a post/article about this compilation, please e-mail them to let them know about it and e-mail me as well so that I can try to contact them. And don't feel like it needs to be limited to sites about the netlabel scene. There are plenty of people around the world who would surely be interested in this project - if they could just hear about it. In yesterday's State of the Project update, I mentioned pushing the deadline forward due to the volume of submissions that I have been receiving and the urgency of generating donations to the relief effort. I will have an official decision in tomorrow's State of the Project update - right now, I am thinking that the submission deadlines for all creative works will be pushed up to April 1st so that the compilation can be released on April 8th while completely removing deadlines for netlabels to make it something that anyone can join, even after it has been released. In addition to the two reasons I mentioned above, I feel that it is important to take advantage of everyone's current eagerness to help Japan. People are already seeking ways to donate, and there's only so much money that anyone can give away - particularly with the current global economic situation. There are specific things that I need help with. If you've been to the Twitter page or the Facebook page, then you have probably seen the logo that I hacked together. This project could really use a more attractive logo. I would like to do this quickly, and I'm thinking that the best option would be to take submissions today and tomorrow, and I'll manage a post on the blog that contains every submission so that we can get a vote going. If there isn't a sufficient number of votes (at least 20), then I will select the logo myself. If you want to submit a logo design for this project, please send an e-mail with a link to the image (please, no attachments) and the name that you would like for it to be attributed to. Images must be 2000x2000 pixels. Please submit it in a common format. Having a vector version of the image on hand would be totally awesome, too. By submitting your work, you are verifying that it is an entirely original product, and you agree to allow your submission posted on this website. If your image is selected, it will be distributed with a Creative Commons BY-NC-SA license (you will still retain full rights to it, though). All works for the logo must be submitted by 12:00PM (yes, I mean noon, not midnight) Pacific Standard Time on March 17th. Voting will begin at that time, and will continue until 12:00PM PST the following day (March 18th). I look forward to seeing all of the wonderful submissions. Submission deadline is past - take a look at them and vote! So, now that the immediate needs for art have been addressed, here's what I'm thinking will need to be addressed longterm. I'll start by explaining my current stance on how to release the compilation (which was discussed at greater length in yesterday's State of the Project update). I received some feedback in the comments saying that limiting the number of songs for the compilation would be desirable. I'm really torn on this one - it feels wrong to tell people that their songs didn't make the cut for a charitable work, particularly when we are not limited by the medium of distribution. Part of what makes the netlabel scene so awesome is that we don't have the restrictions of physical media. On the other hand, I understand that we need to make this compilation desirable, not just ideological. It will be difficult to generate broad interest in a 5+ hour compilation, both inside the netlabel scene and (especially) outside of it. So I've whittled it down to a couple of choices - although, if I receive a lot of feedback, I'm always willing to change things around. A two-CD (there really must be something better to call this!) compilation, amounting to approximately two hours of music. "other" (folk, rock, pop, metal, etc.) - though obviously we'd find something better to call it. Either of these methods would change things pretty fundamentally. First, video-based projects would be much, much more difficult to accomplish; since no song would be guaranteed to be on the compilation until after the submission period ended, it would be an awful lot of effort to either submit a song with a video or to scramble to create a video before the release date once the selected submissions have been announced. I could really use suggestions about this part. Second, being selective about tracks would mean that I would need more people to help select songs. Right now, I'm the only one going through submissions. Ideally, I would have 5 people who have professional/semi-professional experience reviewing music and who have a broad knowledge and understanding of different styles of music. 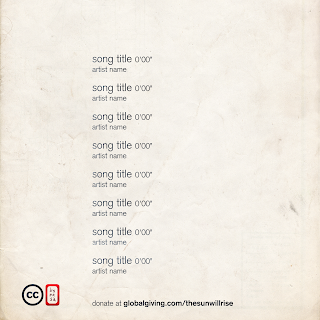 These individuals would not be allowed to submit a song for the compilation, or they would have to recuse themselves from judging their own songs. This rules me out, since I'm submitting a song (and honestly, I don't feel that I have enough experience to have a totally valid opinion regarding selection). If you are interested in filling one of these positions, please send me an e-mail with links to reviews that you have written and review websites/publications that you have managed/worked for. Applications are due by 12:00PM PST on March 20th. I will announce who's been selected to the positions by 6:00PM PST the following day. These positions will be a fair amount of work. You will receive every song that has been submitted and will be expected to rate the vast majority of them by two days after the submission deadline is over, which is when the choices will be whittled down to the final selection and subsequently announced. The third problem: if this is going to be a two or three CD release, these will need to be mastered - in less than a week. Anyone who has mastered an album before probably just had a heart attack from reading that. Mastering is very, very hard work. But that shouldn't scare you off - this will be an excellent challenge to really show off what you can do in a short time when you need to (and anyone who has mastered an album before probably just closed this blog post because they've probably heard that line one-too-many times). But really, this would be incredibly helpful - and don't despair, as I'm hoping that we can get one person to master each CD. Full details on this subject will be in tomorrow's State of the Project update. Now, general art requirements! Took me an awful while to get to this, but here it is. We will need cover art, front and back, for every CD of the release. If you have any ideas, please, send them! The same rules as for the logo apply here. I am considering assembling another panel of judges to review submissions, but I have not decided on that yet. Full details on this subject will also be in tomorrow's State of the Project update. The question that I have received most is, "How can I help?" Well, for one, submitting creative works is definitely not the only option. Posting the completed compilation on a netlabel you run isn't, either. There are a few things that have not yet been mentioned that are incredibly helpful to this project. First thing: Tell everyone who might at all be interested in this project about it! I really cannot overstate how helpful this is. We could publish a compilation containing some of the most incredibly music that has ever been written, but if no one knows about it, then what exactly have we accomplished? The more people that know about this, the more money we can raise for Japan. Second thing: Give feedback! A lot of what I am doing right now is being done mostly in the dark. I have received many, many wonderful e-mails voicing support and expressing encouragement from people so far, and I am exceptionally grateful for every last word of it. It is incredibly encouraging to hear from individuals who support this specific project and the cause in general. I could also really use your suggestions and comments - even criticism! I need to know what would work better. I see this project as a collaborative effort, something where everyone can be a part of this effort to raise money for people who need it in Japan. Everything that I've mentioned in this and other posts is exceptionally useful. Third thing: We need to make this project available in more languages! I would absolutely love to have people translating each blog post into another language, but that is an awful lot of work, particularly considering how long these keep end up being. A more immediate goal is to have people available to translate the text of the official release into as many languages as possible. If you speak fluent English and are fluent in one or more other languages and you are confident that you will have the time to invest in this, please let me know. Also, if you know anything about making a single blog available in multiple languages, please contact me to let me know about that, too. There's also a minor update on the donation-management front. I've sent PayPal an e-mail about getting buttons for donation that would go directly to charities - if this works out, it should be an even better solution than trying to rely on Bandcamp for that aspect. If PayPal can do this, then I will make sure that they can track how much money is coming in through those buttons; and if that works, then one of the biggest hurdles will be taken care of! There would be no need for me to manage the money and get it to the charities, essentially cutting out the middle man. It would also make donating much, much more convenient for everyone. Fingers crossed! Congratulations on making it to the end of this post. And thank you for caring enough about this to take the time out of your day to do so. Honestly, your efforts are just as (if not more) important to this project's success than mine are. Always remember that we're all in this together. This cause is our cause, and our cause is to help Japan. Let me start by saying wow. I had no idea that there would be so much interest in this project - it has been about 7 hours since the project went live, and I've already received multiple music submissions, offers to help (both general help and with artwork/graphic design), and offers from labels to post the compilation when it is complete. I cannot thank everyone enough for their support on this project. I have gone from being confident to being absolutely certain that we will all make this project a resounding success. Now, on to the State of the Project update. I neglected to mention the specific license that this will be released under. 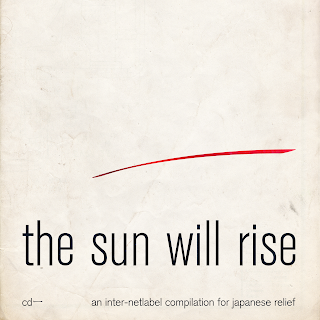 If you are an artist submitting music to this compilation, you agree to allow the song to be published under a Creative Commons BY-NC-SA license (although, if it is a major concern for many contributors, I reserve the right to change it to a non-derivative license). By extension, in submitting a track for the compilation, you agree that you hold the exclusive rights to your song. If you submit the song and do not have the rights, you reserve the right to withdraw your submission up until the time that the compilation is released, excepting legal circumstances that require the withdrawal of the track from the finished compilation. If you have already submitted a track to me, I will be sending out an e-mail notifying you of these changes. If you need to withdraw your submission, that is perfectly alright - there is no need to get into a tricky legal situation. 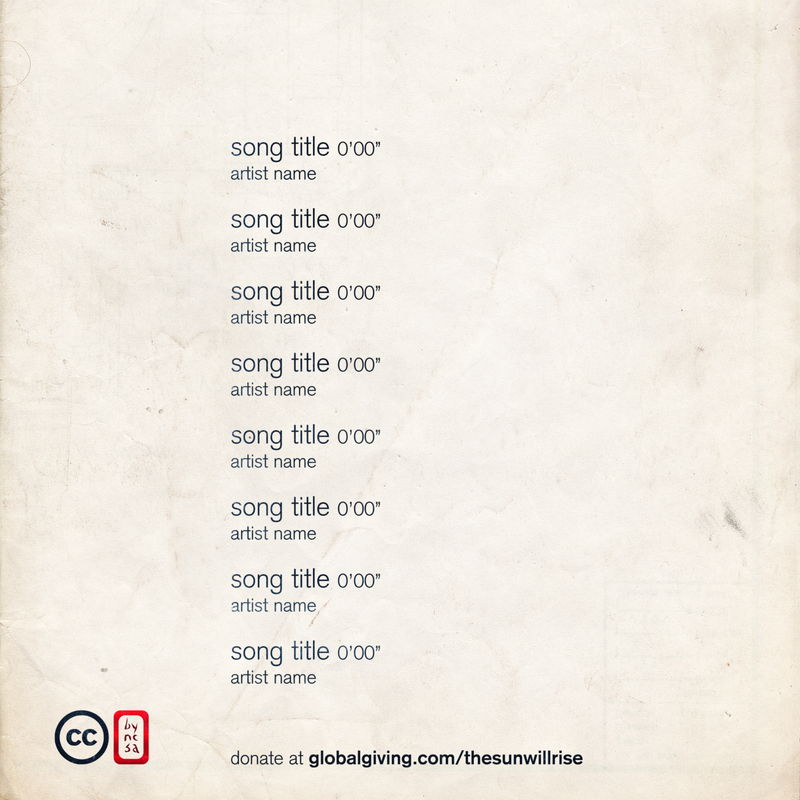 There are many ways to help out other than submitting a song. This also means that labels will be required to release the compilation under the same license. If you have already offered to distribute the compilation and this new information prevents you from releasing it, please inform me. Since I have received such a large volume of submissions already, I am considering a few things. First, if the volume of submissions increases as the deadline nears, I worry that we could end up with at least 24 hours of music. There are a few things that I am considering as a solution, and I would love to receive feedback or suggestions. Release the compilation as a single "CD" (60 or so minutes in length). This is the option I like least, as it would mean having to be highly selective in what gets released - and that rather defeats the purpose! And who am I to say what does and does not deserve to be on the compilation? On the other hand, this would make it less prohibitive for labels to distribute, as bandwidth costs could get very expensive with a very large compilation. Release the compilation as a few "CDs." This would be something like 3 CDs. This is also a rather unattractive option for the same reasons as above, though it is a bit more allowing then the previous suggestion. Release the compilation as a sort of core "CD or CDs" like the other two options, and have an extended compilation that includes all submissions that meet the guidelines. Not sure about this one. Thoughts? Release the compilation in multiple themed "CDs" (I need to find a better word for this). What I mean by this is having an ambient collection, a noise collection, a folk collection, etc. The main problem I have with this one is forcing genres on every song for the sake of organization; as an artist myself, I often find genres to be limiting. On the other hand, this is appealing because it would allow listeners to more easily select what to listen to - it is pretty daunting to stare at an enormous list of songs without knowing what any of them will sound like. As everyone is no doubt aware, Japan was hit with a major natural disaster on March 11th. The country's citizens are in dire need of humanitarian aid.